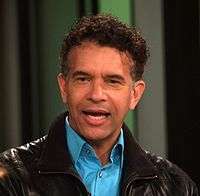 Brian Stokes Mitchell (born October 31, 1957) is an American stage, film and television actor and singer. A powerful baritone, he has been one of the central leading men of the Broadway theatre since the early 1990s. He won the Tony Award for Best Actor in a Musical in 2000 for his performance in Kiss Me, Kate. Mitchell was born in Seattle, Washington, the youngest of four children of George Mitchell, an electronics engineer, and his wife Lillian, a school administrator. Mitchell grew up at various U.S. military bases overseas, where his father was a civilian engineer for the U.S. Navy. As a teenager, he lived in San Diego, California, where he began acting in school musicals. He did not attend college, having begun performing professionally in high school, although he did have private teachers in both acting and voice in his teen years. He has said that he studied film scoring, orchestration, and conducting through UCLA. Prior to Ragtime, he was known professionally as Brian Mitchell. Mitchell first performed on Broadway in the musical Mail in 1988, with music by Michael Rupert and lyrics by Jerry Colker, winning the Theatre World award. His Broadway credits include an all-black revival of George and Ira Gershwin's Oh, Kay! (1990), Jelly's Last Jam (1992) based on the works of jazz artist Jelly Roll Morton and Kander and Ebb's Kiss of the Spider Woman (1993). He performed the role of Coalhouse Walker Jr, in the musical Ragtime, which opened on Broadway in January 1998. He received a 1998 Tony Award nomination for Best Actor in a Musical. He appeared in the 1999 revival of Cole Porter's Kiss Me, Kate as Fred Graham / Petruchio, winning the Tony Award;  King Hedley II (2001) (Tony Award nomination); and Man of La Mancha (2002) (Tony Award nomination). He appeared in the New York City Center Encores! staged concert productions of Jule Styne's Do Re Mi (1999), Bob Merrill's Carnival! (2002), Kismet (2006) and The Band Wagon in 2014. He played the title role in the 2002 Kennedy Center production of Sweeney Todd, part of the Stephen Sondheim celebration. On June 9, 2005, Mitchell appeared in a concert version of the Rodgers and Hammerstein musical South Pacific at Carnegie Hall. He starred as Emile, alongside Reba McEntire as Nellie Forbush and Alec Baldwin as Luther Billis. The production was taped and telecast by PBS in 2006. His debut solo CD Brian Stokes Mitchell was released on June 6, 2006 on Playbill Records. Mitchell has also performed in a Christmas concert with the Mormon Tabernacle Choir later released as a CD and DVD entitled Ring Christmas Bells. His second solo CD, "Simply Broadway," was released October 30, 2012, by CD Baby. Mitchell returned to Broadway to star with Patti LuPone in the musical version of the Pedro Almodóvar film Women on the Verge of a Nervous Breakdown, which opened at the Belasco Theatre in November 2010. A new musical titled Shuffle Along, or, the Making of the Musical Sensation of 1921 and All That Followed, based on the making of Shuffle Along opened on Broadway on March 14, 2016 in previews, officially on April 21 at the Music Box Theatre. Mitchell plays "F.E. Miller", with Audra McDonald as "Lottie Gee", Billy Porter, Joshua Henry and Brandon Victor Dixon. Mitchell has a number of television and film credits, including the role of John Dolan in Roots: The Next Generations (1979), and a seven-year stint as Dr. Justin 'Jackpot' Jackson on Trapper John, M.D. from 1979 to 1986. Mitchell made several appearances as a celebrity panelist on episodes of $25,000 Pyramid and $100,000 Pyramid in the 1980s, and was considered one of the game's better celebrity players. He played recurring roles as Hilary Banks' news anchor fiancé Trevor Newsworthy/Collins on The Fresh Prince of Bel-Air and on Frasier as Dr. Frasier Crane's upstairs neighbor and nemesis Cam Winston. He supplied the singing voice of Jethro in the animated feature The Prince of Egypt (1998). He guest starred in March 2010 in Ugly Betty as Wilhelmina Slater's ex-boyfriend, Don. Marquee outside the Winspear Opera House in Dallas, Texas, promoting the September 1, 2011 appearance of Brian Stokes Mitchell in concert. He has also done voice-overs for animation including Animaniacs, Capitol Critters, Tiny Toon Adventures, A Pup Named Scooby-Doo, The Further Adventures of SuperTed, Kid 'n Play, The New Kids on the Block, Scooby-Doo and the Reluctant Werewolf, Gravedale High, Potsworth & Co., Captain Planet and the Planeteers, The Tom and Jerry Kids Show, Yo Yogi!, Fantastic Max, Pound Puppies, The Addams Family, California Raisins, The Angry Beavers, James Bond Jr., Batman: The Animated Series, Paddington Bear, Pinky and the Brain, Defenders of Dynatron City, The Hot Rod Dogs and Cool Car Cats, Droopy, Master Detective, Denver, the Last Dinosaur, Mighty Max, Don Coyote & Sancho Panda and the two Flintstones animated movies Hollyrock-a-Bye Baby and I Yabba-Dabba Do!. He appeared on the 57th episode of Glee, titled "Heart" in 2012, and the 58th, titled "On My Way," as one of Rachel's dads (LeRoy) along with Jeff Goldblum. He has been cast in a recurring role on the USA Network series Mr. Robot as Scott Knowles, CTO of Evil Corp. The series began in June 2015. He is the Chairman of the Board of the Actors Fund of America, having been elected in 2004. ↑ Hetrick, Adam (July 26, 2010). "Patti LuPone, Brian Stokes Mitchell, Sherie Rene Scott Cast in Broadway's Women on the Verge". Playbill.com. ↑ "The New $25,000 Pyramid - Frank/Cindy 1/3". YouTube.com. March 18, 1983. ↑ "$100,000 Pyramid - Brian Mitchell". YouTube.com. October 1986. ↑ Abrams, Natalie (January 25, 2010). "Ugly Betty Casts Tony Winner as Willie's Ex". TVGuide.com. ↑ "The 2016 Tony Awards: Winners". TonyAwards.com. Retrieved 2016-06-14. "Playbill Records and Legacy Recordings Present Brian Stokes Mitchell". Playbill Records. 2008. Retrieved 2008-06-09. "Brian Stokes Mitchell". Legacy Recordings. 2008. Retrieved 2008-06-09.